Today is my birthday. And I will tell you right up front that I turn 38 today. Why am I being so open about my age? Well, because I've decided to join yet another reading challenge that will force me to reveal how old I am. 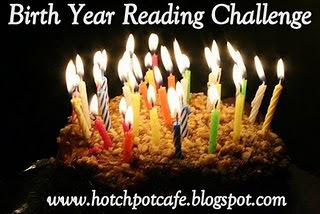 It's the Birth Year Reading Challenge, hosted by Hotchpot Cafe, which I discovered through Book in Hand. I think this is a fun challenge, so I may add more to my list as I go along.